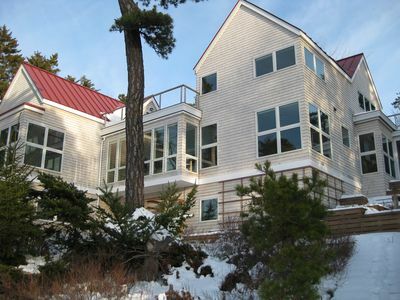 Located in Harpswell, Maine just south of Brunswick, this oceanfront contemporary cottage is all about the water. 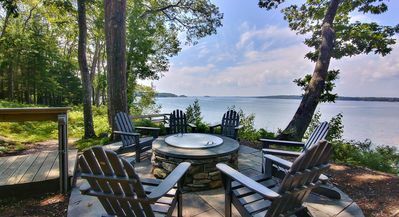 Quahog Bay cottage boasts a multi-tier waterside outdoor living space leading down to the dock and float and beautiful water views from practically every room. Sunrises are particularly spectacular here. 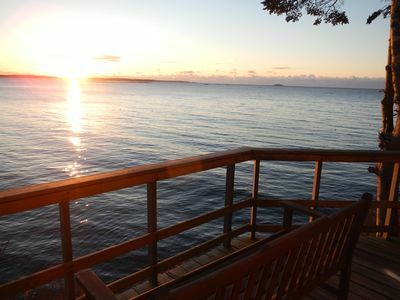 Take that morning cup of coffee and sit out on one of the three open decks and enjoy the sun rising, watching lobstermen pull their traps, birds fishing for breakfast and the area waking up to another great day in Maine. You are but a short drive to Brunswick where you can enjoy a show at the Maine State Music Theater located on the Bowdoin College Campus, or take a ride down to Freeport and explore LL Bean and the many outlets there. 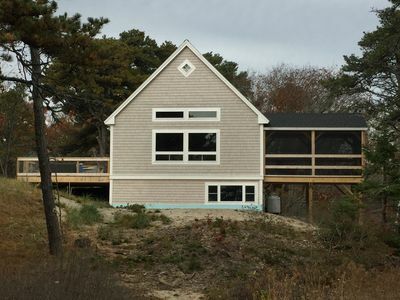 THE HOUSE: As you enter the cottage on the first floor into the living/dining/kitchen area, you are struck by the view that is right in front of you and the large windows and sliding doors that bring in all that wonderful natural light. 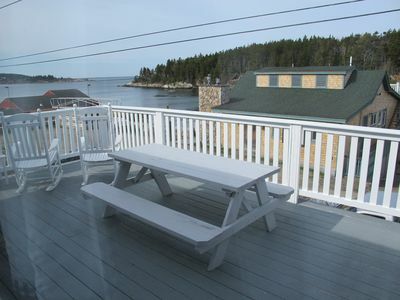 Sailboats, motorboats, lobster boats, kayaks, birds and more call out to you to come on outside and enjoy. 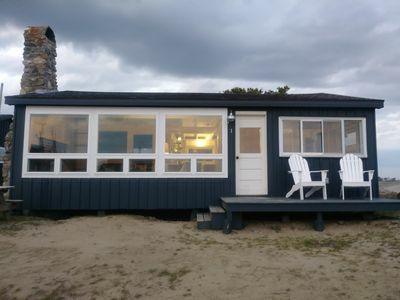 Also on the first floor is a 3/4 Shower Bathroom and bedroom with a king bed. Sliders provide the entry to the waterside deck and lower outdoor sitting area. 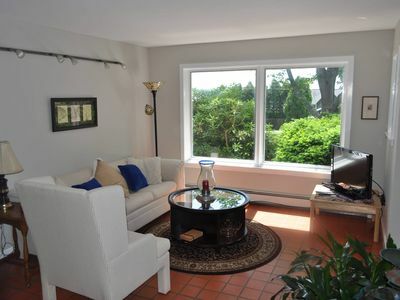 Walk up the stairs into a sitting area with futon for sitting or sleeping and a mini fridge to keep drinks cold. 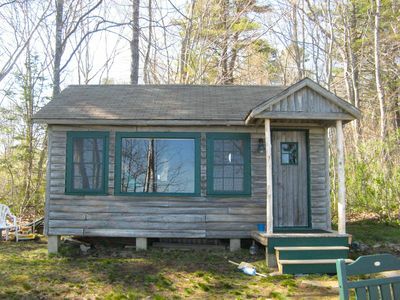 There are two bedrooms on the second floor with a combination shower and tub bathroom as well. 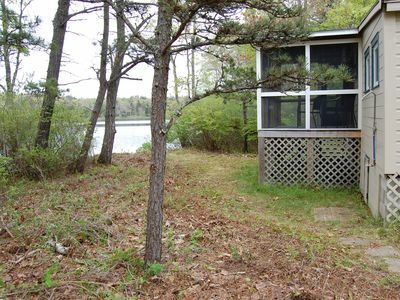 There is a balcony that goes along the water side of this floor that you can enjoy from each bedroom or that middle, family room. 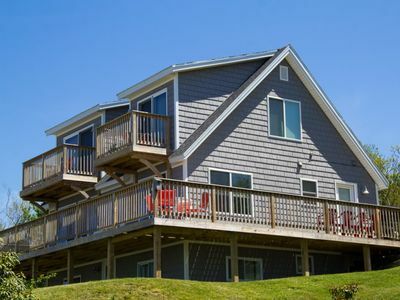 Views of Quahog Bay and North Ledges across the bay from this house will keep you wanting for more. 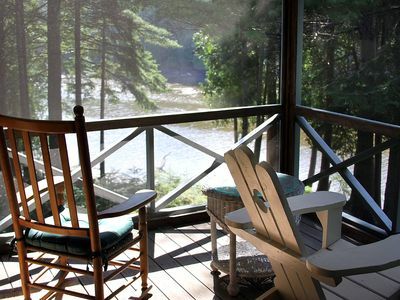 The sitting area provides a perfect quiet spot for reading and just watching the view. 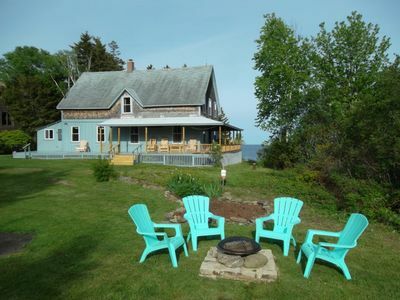 This cottage has been in the family for several generations, each enjoying the time they spend here. They are excited about sharing it with you. 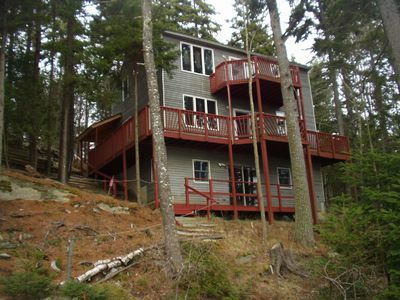 This part of Midcoast Maine provides many activities and adventures for visitors. Take a short drive down to Lands End on Bailey's Island and see the statue dedicated to those who lost their lives at sea. Or drive north and explore Bath and the Maine Maritime Museum or any of the great restaurants here - Tavern on the Kennebec and Mae's are two of our favorites. Brunswick, home to the Maine State Music Theater is another great source for entertainment and restaurants - Japanese, Mediterranean, Italian, German, they all have a home here. South of Brunswick is Freeport home to LL Bean and many other outlets. Perhaps you'd like to take in a fly fishing class or kayaking? 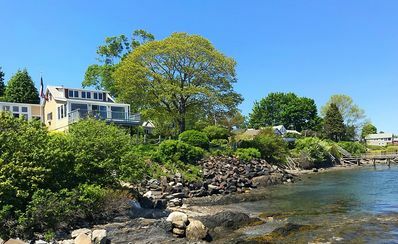 Drive a little North and you can visit Wiscasset known for its antique stores and Red's Eat (famous lobster roll) or venture down the next peninsula and visit Boothbay Harbor area home to the Coastal Maine Botanical Gardens. Run out of things to do? Give us a call and we'll happily assist you with additional activities. Home to Bath Iron Works and the Maine Maritime Museum, Bath has a history steeped in the Maritimes, nautical and seafaring trades and of course boat building on a grand scale. 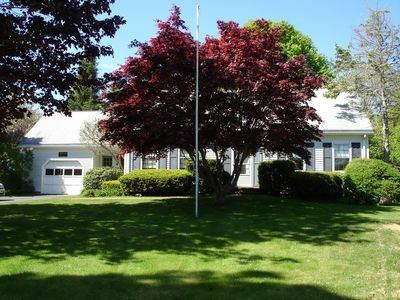 Located at the mouth of the Kennebec River, Bath is a modern and vital community in Mid-coast Maine that has deep historical roots dating back to the original Popham Colony established in 1607. 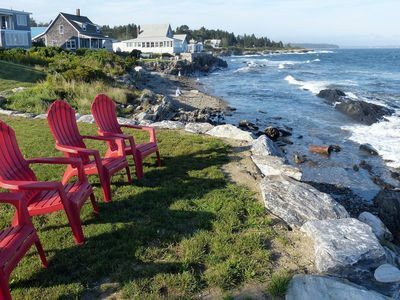 Enjoy local shops, eateries and galleries downtown and explore Reid State Park, Popham Beach State Park and Kennebec Land Trust Be sure to check the calendar for the Summer music series while you are here! The Native Americans who originally inhabited Harpswell were part of the Abenaki. 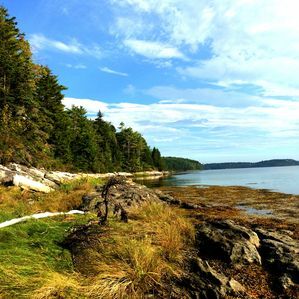 The Abenaki name for Harpswell Neck, then called West Harpswell, was Merriconeag or "quick carrying place", a reference to the narrow peninsula's easy portage. 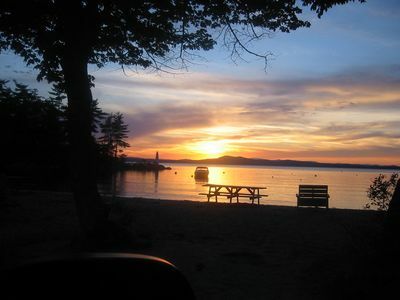 The Abenaki name for Great Island was Erascohegan or Sebascodiggin, which became by the late 1800s Sebascodegan Island. About 1659 Major Nicholas Shapleigh of Kittery, Maine, bought Merriconeag and Sebascodegan Island from the Abenaki, but because of Indian attacks, attempts to settle the area were abandoned until after Dummer's War. The Treaty of 1725 brought a truce, and by 1731 many settlers had returned. Formerly a part of North Yarmouth, in 1758 the town was incorporated by the Massachusetts General Court and named for Harpswell in Lincolnshire, England, Industries included farming and some shipbuilding, but fishing brought considerable profit. 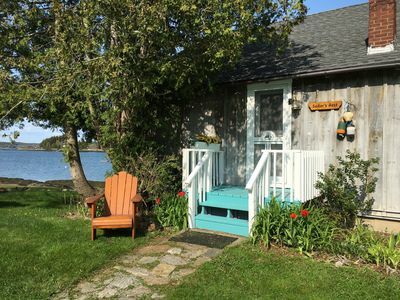 Because of its scenic beauty, Harpswell is today a favorite with artists and tourists. The Bailey Island Bridge is an Historic Civil Engineering Landmark. 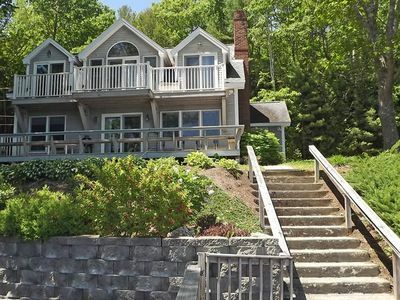 Waterfront home on scenic cove. 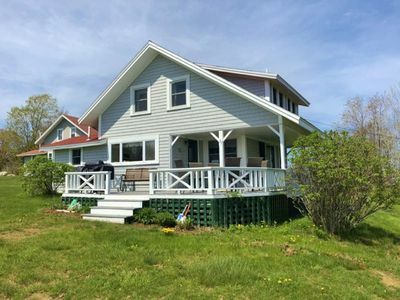 Newly Remodeled Waterfront Cottage with Panoramic Views!